Owls of the world, we love what you do. 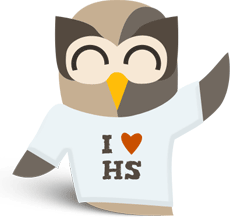 There are so many remarkable user-created tutorials and videos out there to help spread the word and share the love of HootSuite – it makes us happy to see that others share our enthusiasm for the great things the dashboard can do. We want to share them all and collect some of the best in our User Created Tutorials forum – be sure to check them out and add your own to get your content in fromt of more of your fellow HootSuite fans. HootSuite: Integrate all your platforms: Our personal favorite is HootSuite because of the depth of its products and services. You can update multiple social media platforms (Twitter, Facebook and more) from a computer or iPhone, Android or Blackberry. A team of users can track results of their interactions and create a dash board that will work efficiently with their preferred social streams. It’s becoming very clear that social media matters… to everything. Looking for a job? Social media. Building business? Social media. Maintaining or developing friendships (professional or personal)? Social media. And guess what – it isn’t just for Gen-Y. Twitter is mostly an adult and professional network. So is LinkedIn. Facebook is becoming popular among most ages. The best part of all of this is that it is getting easier and easier to understand, use, and adopt every day thanks to tools such as Hootsuite. Twitter has been introducing me to some incredible people around the world. I’m blown away and humbled every day by the immense talent I am fortunate enough to spend time with. Today is no different as Nicole Yeary of AelloLUXE shares her story. Nicole’s back story is incredibly inspiring. In this interview, Nicole tells us about her move to Chicago and how she lost her job only a month later (after signing an 18 month lease on a condo). She talks about her job search, her difficulties, how she found a way through all of it, and how a business that showcases her tremendously valuable talents developed as a result of the whole crazy adventure. If you are in a similar situation, this story is incredibly inspiring and can give you some ideas on how to take control of your own situation, too. This call is also great if you are using social media but are not using a dashboard tool to keep up with all your social media profiles. Nicole gives some incredible insight into Hootsuite and how it can explode your social media experience. The main reason I use HootSuite is that it does a great job of scheduling tweets, so that I can queue up a day or even a week’s worth of tweets at a time. This feature is so valuable that I’ll write a blog post focusing specifically on how to use HootSuite for scheduling tweets. Yes, Tweetdeck (my preferred Twitter client for over a year) also has a “tweet later” feature, but I found it quite erratic. The other benefit of using HootSuite is its support for team-based tweeting. Since I share a few of my Twitter accounts with colleagues, it can be useful for us to share Hootsuite tabs so that we can monitor the same Twitter searches or collaborate in drafting tweets. Let me introduce you to my travel companion, Hootsuite. Before I knew anything about Hootsuite, I had the usual issue of having multiple tabs open all the time. One for facebook, one for Twitter (and only one account at a time! ), this blog and whatever else I was researching at the time. But my good friend and Internet pro Paula Seymour, saved me from my own destruction by introducing me to the wonders of Hootsuite. Easily check stats and track results. For example, you can see how influential you were on Twitter in the last day, week, or month. See which of your tweets were popular so you know what type or topic to send out more of and which to avoid. You can also see what influencers have mentioned you so you can continue to build relationships with them. This feature really helps you with the Test – Track – Repeat cycle in your marketing. Get your team involved. If you have multiple people that help you with your social media, you can give them all unique log in information so they can access the account without sharing passwords. You can also assign tasks, such as delegating a certain team member messages you want them to respond to, etc. Easily manage multiple social media accounts. Send out messages to multiple networks at one time and keep track of mentions of your brand or key terms on any of the sites you have integrated with Hootsuite. You can also look at the live feeds from people you are following on Twitter, friends with on Facebook, etc. so you can keep up to date with everything and know when your input could be helpful. Use your smartphone to manage your account. Not only can you log in straight from your computer, but you can download the app for your Android, iPhone, or other smartphone and update and manage your Hootsuite from wherever you are, whenever you want to. I’m a twitter account administrator of several accounts. I wanted to update the list of one of the accounts I administer and unfollow twitter accounts that were not following us. I posted the question on twitter and got a response from @Richerd. Richerd is a extremely knowledgeable hootsuite programmer. So what do you do if you want to unfollow, and you cant log directly into twitter? You could do a search for the user and then unfollow on their info tab. That however is very time consuming and you wont find all of the users. Its a good idea to keep your following count low when people don’t follow you. What you can do is add them to a list if you still want to follow them. There are tools that you can use to help determine who is still following you. I found @doesfollow really easy to use. Just discovered something else while cleaning up my following list. You can drag and drop a user into a list on the left hand side of the contacts page. Really cool feature. Click on the image of the person or name and drag it to the list you want. That simple. You can then unfollow them if they don’t follow you. Monitoring on lists is better then having people that don’t follow you in your stream. It makes for less chatter in your main stream as well. 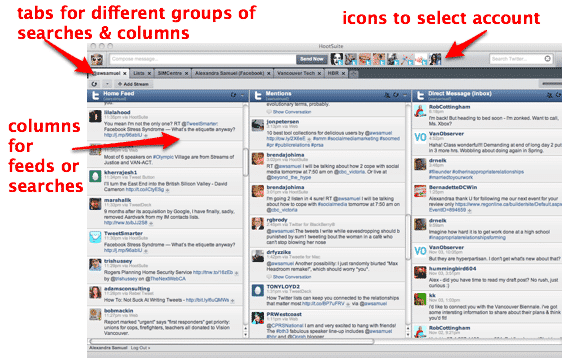 … One of the best features of HootSuite is that it allows you to open a “window” with your Twitter lists in them. This allows you to quickly identify those Twitter users that you wish to re-tweet their work. For example, if you have fellow Helium writers in a list called “Helium” you can open that list in a separate column in HootSuite for easy identification. This allows you to easily identify your favorite Twitter users without having to depend on your main Twitter stream. Heard about HootSuite? It’s a hoot to use! Twittering has progressed from a social “message burst” to a full-fledged social media tool, and more applications are being developed around its unique appeal. There’s a new player in this scenario, and it’s a hoot to use! The newest in social media, HootSuite, is pegged as a “social media dashboard”, offering a lot of valuable Twitter resources for those of us that like to Tweet a lot or have multiple accounts. Q: One of the most interesting things about HootSuite is its use of the freemium model. How does it work, and why did you choose to go in that direction? A: By the time I speak at the conference, I’ll have a lot more information for people. We just launched it for new users. We’re investigating how it’s working for people and seeing what they’re liking and what they’re hating, and having success so far. We decided to go with freemium because we didn’t want to cannibalize our growth, so we wanted to keep the product free. We think it’s important to have a strong base of users out there who are passionate about the product, and we have very passionate users and loyal fans who use our product every day. We go to conferences and meet people there, and [I] introduce myself and it’s really amazing to see people’s eyes light up. They say, “Oh my god, you’re with HootSuite, I use your product every day.” And it’s funny because I don’t think anyone gets that passionate about like, “Oh, you’re with Outlook, I use Outlook every day.” Or “Oh, you’re with Firefox, I use Firefox every day.” So we have really great fans and users who ultimately evangelize for us. And then on the paid side, we have people who really need good user functionality and a solid tool, and we’re able to provide that for them… We always had plans to monetize through freemium. You can find all sorts of tutorials and videos on our User-Created Tutorials page. It’s just one of our resources designed to help improve your HootSuite experience and knowledge. The Help Desk is another great place to find answers to almost any question you might have, and stay tuned to @hootwatch and our Delicious social bookmarks feed for all the latest hoots on all things HootSuite. Missing anything? If there is a great tutorial that you’ve seen or created that hasn’t made our page yet, add it to the User-Created Tutorials page. Not only will you be helping others to discover the benefits of the dashboard, it’s a great way for you to attract a wider audience.